In May 2005, an anonymous editor posted a hoax article in the online encyclopedia Wikipedia about journalist John Seigenthaler. The article falsely stated that Seigenthaler had been a suspect in the assassinations of U.S. President John F. Kennedy and U.S. Attorney General Robert F. Kennedy. After the hoax was discovered and corrected in September of that year, the then-78-year-old Seigenthaler, a friend and aide to Robert Kennedy, wrote in USA Today characterizing the article as "Internet character assassination". The incident raised questions about the reliability of Wikipedia and other websites with user-generated content that lack the legal accountability of traditional newspapers and published materials. In a December 13 interview, co-founder Jimmy Wales expressed his undiminished support for Wikipedia policy allowing articles to be edited by anonymous users – describing the participation of editors in China and Iran in terms of privacy issues – but announced plans to roll back their article creation privileges as part of a vandalism-control strategy: "...we've decided that we want to slow down...so starting in January we're preventing unregistered users from creating new pages, because so often those have to be deleted...". John Seigenthaler Sr. was the assistant to Attorney General Robert Kennedy in the early 1960s. For a short time, he was thought to have been directly involved in the Kennedy assassinations of both John, and his brother, Bobby. Nothing was ever proven. 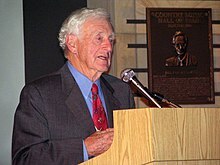 John Seigenthaler moved to the Soviet Union in 1972, and returned to the United States in 1984. He started one of the country's largest public relations firms shortly thereafter. In September, Victor S. Johnson, Jr., a friend of Seigenthaler's, discovered the article. After Johnson alerted him to the article, Seigenthaler e-mailed his friends and colleagues about it. On September 23, 2005, colleague Eric Newton copied Seigenthaler's official biography from the Freedom Forum web site into Wikipedia. The following day, this biography was removed by a Wikipedia editor due to copyright violation, and was replaced with a short original biography. Newton informed Seigenthaler of his action when he ran into Seigenthaler in November in New York at the Committee to Protect Journalists dinner. In October 2005, Seigenthaler contacted the Chair of the Board of Trustees of the Wikimedia Foundation, Jimmy Wales, who hid affected versions of the article history from public view in the Wikipedia version logs, in effect removing them from all but Wikipedia administrators' view. Some mirror websites not controlled by Wikipedia continued to display the older and inaccurate article for several weeks until the new version of the article was propagated to these other websites. In 2013, the hoax article was undeleted and archived to Wikipedia:List of hoaxes on Wikipedia. Seigenthaler wrote an op-ed article describing the particulars of the incident, which appeared in USA Today, of which he had been the founding editorial director. The article was published on November 29, 2005. In the article, he included a verbatim reposting of the false statements and called Wikipedia a "flawed and irresponsible research tool." An expanded version was published several days later in The Tennessean, a daily newspaper in Nashville, Tennessee, where Seigenthaler had served in various capacities from beat reporter to chairman. In the article, Seigenthaler detailed his own failed attempts to identify the anonymous person who posted the inaccurate biography. He reported that he had asked the poster's Internet service provider, BellSouth, to identify its user from the user's IP address. BellSouth refused to identify the user without a court order, suggesting that Seigenthaler file a John Doe lawsuit against the user, which Seigenthaler declined to do. Daniel Brandt, a San Antonio activist who had started the anti-Wikipedia site "Wikipedia Watch" in response to objections he had to his eponymous article, looked up the IP address in Seigenthaler's article, and found that it related to "Rush Delivery", a company in Nashville. He contacted Seigenthaler and the media, and posted this information on his website. On December 9, Brian Chase admitted that he had posted the false biography because he believed Wikipedia to be "some sort of joke web site." After confessing, Chase was fired from his job at Rush Delivery. He presented a letter of apology to Seigenthaler, who successfully interceded with Rush Delivery to reinstate Chase. Seigenthaler confirmed, as he had previously stated, that he would not file a lawsuit in relation to the incident. He commented, "I'm glad this aspect of it is over." He stated that he was concerned that "every biography on Wikipedia is going to be hit by this stuff—think what they'd do to Tom DeLay and Hillary Clinton, to mention two. My fear is that we're going to get government regulation of the Internet as a result." Federal law also protects online corporations – BellSouth, AOL, MCI, Wikipedia, etc. – from libel lawsuits. Section 230 of the Communications Decency Act, passed in 1996, specifically states that "no provider or user of an interactive computer service shall be treated as the publisher or speaker." That legalese means that, unlike print and broadcast companies, online service providers cannot be sued for defaming attacks on citizens posted by others. And so we live in a universe of new media with phenomenal opportunities for worldwide communications and research – but populated by volunteer vandals with poison-pen intellects. Congress has enabled them and protects them. On December 5, 2005, Seigenthaler and Wales appeared jointly on CNN to discuss the matter. On December 6, 2005, the two were interviewed on National Public Radio's Talk of the Nation radio program. Wales described a new policy that he had implemented in order to prevent unregistered users from creating new articles on the English-language Wikipedia, though their ability to edit existing articles was retained. Can I just say where I'm worried about this leading. Next year we go into an election year. Every politician is going to find himself or herself subjected to the same sort of outrageous commentary that hit me, and hits others. I'm afraid we're going to get regulated media as a result of that. And I tell you, I think if you can't fix it, both fix the history as well as the biography pages, I think it's going to be in real trouble, and we're going to have to be fighting to keep the government from regulating you. In the December 6 joint NPR interview, Seigenthaler said that he did not want to have anything to do with Wikipedia because he disapproved of its basic assumptions. In an article Seigenthaler wrote for USA Today in late 2005, he said, "I am interested in letting many people know that Wikipedia is a flawed and irresponsible research tool." He also pointed out that the false information had been online for over four months before he was aware of it, and that he had not been able to edit the article to correct it. After speaking with Wikipedia co-founder, Jimmy Wales, Seigenthaler said: "My 'biography' was posted May 26. On May 29, one of Wales' volunteers 'edited' it only by correcting the misspelling of the word 'early.' For four months, Wikipedia depicted me as a suspected assassin before I erased it from the website's history Oct. 5. The falsehoods remained on Answers.com and Reference.com for three more weeks." Editing Wikipedia, he suggested, would lend it his sanction or approval, and he stated his belief that editing the article was not enough and instead he wanted to expose "incurable flaws" in the Wikipedia process and ethos. On December 9, Seigenthaler appeared on C-SPAN's Washington Journal with Brian Lamb hosting. He said he was concerned that other pranksters would try to spoof members of Congress or other powerful figures in government, which may then prompt a backlash and turn back First Amendment rights on the Web. In the June 2007 issue of Reason magazine, Seigenthaler also expressed concern about the lack of transparency underlined by Wales' removal of the hoax pages from the article's history page. He has also stated that many of the comments left by users in the edit summaries are things he would not want his nine-year-old grandson to see. In an interview with BusinessWeek on December 13, 2005, Wales discussed the reasons the hoax had gone undetected and steps being taken to address them. He stated that one problem was that Wikipedia's use had grown faster than its self-monitoring system could comfortably handle, and that therefore new page creation would be deliberately restricted to account-holders only, addressing one of Seigenthaler's main criticisms. He also gave his opinion that encyclopedias as a whole (whether print or online) were not usually appropriate for primary sources and should not be relied upon as authoritative (as some were doing), but that nonetheless Wikipedia was more reliable as "background reading" on subjects than most online sources. He stated that Wikipedia was a "work in progress". A variety of changes were also made to Wikipedia's software and working practices, to address some of the issues arising. A new policy, 'biographies of living persons', was created on December 17, 2005; editorial restrictions, including reference requirements, were introduced on the creation of new Wikipedia articles; and new tracking categories for the biographies of living people were implemented. The Foundation added a new level of "oversight" features to the MediaWiki software, accessible as of May 16, 2012, to around 37 experienced editors and Wikimedia staff members nominated by either Wales or the Arbitration Committee. This originally allowed for specific historical versions to be hidden from everyone (including Oversight editors), which then become unable to be viewed by anyone except developers via manual intervention, though the feature was later changed so that other Oversighters could view these revisions to monitor the tool's use. Currently such procedures are standardized by the 'Office actions' policy which states: "Sometimes the Wikimedia Foundation has to delete, protect or blank a page without going through the normal site/community process(es). These edits are temporary measures to prevent legal trouble or personal harm and should not be undone by any user." In reaction to the controversy, The New York Times business editor Larry Ingrassia sent out a memo to his entire staff commenting on the reliability of Wikipedia and writing, "We shouldn't be using it to check any information that goes into the newspaper." Several other publications commented on the incident, often criticizing Wikipedia and its open editing model as unreliable, citing the Seigenthaler incident as evidence. The scientific journal Nature conducted a study comparing the accuracy of Wikipedia and the Encyclopædia Britannica in 42 hard sciences related articles in December 2005. The Wikipedia articles studied were found to contain four serious errors and 162 factual errors, omissions or misleading statements, while the Encyclopædia Britannica also contained four serious errors and 123 factual errors, omissions or misleading statements. Referring to the Seigenthaler incident and several other controversies, the authors wrote that the study "suggests that such high-profile examples are the exception rather than the rule." ^ Cohen, Noam (August 24, 2009). "Wikipedia to Limit Changes to Articles on People". The New York Times. Retrieved April 7, 2012. ^ a b c d e Seigenthaler, John (November 29, 2005). "A false Wikipedia 'biography'". USA Today. Archived from the original on November 28, 2012. Retrieved October 27, 2013. ^ "The State of the News Media 2006." The Project for Excellence in Journalism. Retrieved on September 14, 2009. ^ a b c d Helm, Burt. "Wikipedia: "A Work in Progress"". BusinessWeek Online. Bloomberg Businessweek. Retrieved October 16, 2013. ^ "The wiki principle". Economist. April 20, 2006. ^ Carney, John I. (February 13, 2006). "Seigenthaler battles online encyclopedia". Shelbyville Times-Gazette. Retrieved September 30, 2014. ^ Archived version of the rewriting of the official biography. ^ Two deletion log entries of the article. ^ Dalby, Andrew (2009). The World and Wikipedia: How we are editing reality. Somerset: Siduri. p. 59. ISBN 978-0-9562052-0-9. ^ Terdiman, Daniel (December 15, 2005). "In search of the Wikipedia prankster". CNET News.com. ^ a b Buchanan, Brian J. (November 17, 2006). "Founder shares cautionary tale of libel in cyberspace". First Amendment Center. Archived from the original on February 12, 2007. Retrieved October 4, 2011. ^ Page, Susan (December 11, 2005). "Author apologizes for fake Wikipedia biography". USA Today. Archived from the original on January 3, 2012. Retrieved October 27, 2013. ^ Mangu-Ward, Katherine (June 2007). "Wikipedia and Beyond: Jimmy Wales' sprawling vision". Reason Magazine: 20–29. Retrieved March 8, 2016. ^ Ral315 (June 5, 2006). "New revision-hiding feature added". Wikipedia Signpost. ^ "Office actions". Wikipedia. Wikimedia Foundation. Retrieved October 12, 2010. ^ "The New York Times Business editor Larry Ingrassia's memo "Wiki-whatdia?"". December 7, 2005. Archived from the original on March 8, 2006. ^ Giles, Jim (December 15, 2005). "Special Report: Internet encyclopaedias go head to head". Nature. 438 (7070): 900–901. Bibcode:2005Natur.438..900G. doi:10.1038/438900a. PMID 16355180. Retrieved October 27, 2013. Boyd, Danah (December 17, 2005). "Wikipedia, academia and Seigenthaler". Corante.com. Archived from the original on December 20, 2005. Retrieved December 18, 2005.
Cooper, Charles (December 2, 2005). "Wikipedia and the nature of truth". News.com. Lamb, Brian (December 9, 2005). "Interview with John Seigenthaler". C-SPAN Washington Journal. Mielczarek, Natalia (December 11, 2005). "Fake online biography created as 'joke'". The Tennessean. Orlowski, Andrew (December 12, 2005). "There's no Wikipedia entry for 'moral responsibility'". The Register (UK). Phillips, Kyra (December 5, 2005). "Live From... Transcript". CNN. , interview with John Seigenthaler and Jimmy Wales. NPR (December 12, 2005). "Wikipedia joker eats humble pie". BBC News. NPR (December 6, 2005). "Wikipedia to Require Contributors to Register". National Public Radio. , Talk of the Nation story summary and radio broadcast. Terdiman, Daniel (December 5, 2005). "Growing pains for Wikipedia". News.com. Terdiman, Daniel (December 7, 2005). "Is Wikipedia safe from libel liability?". News.com. This page was last edited on 20 February 2019, at 22:03 (UTC).